This is hard to make up. AUSTIN, Texas — Sen. Ted Cruz’s re-election campaign is sending fundraising letters in envelopes marked “Summons Enclosed — Open Immediately,” suggesting they could contain court appearance orders. Instead the Cruz campaign is asking for donations to his campaign. You have to wonder why Ted Cruz would target only those in San Antonio. He didn't send the notice to potential donors in Houston or Dallas. Instead he only focused on San Antonio. Maybe it has to do with his latest appearance and selfie taken from game 7 of the Rockets, Warriors game. Cruz attended. We lost. He left early. The "Summons" letter was considered a threat to Spurs fans, and San Antonio loves their 5 time world champions. 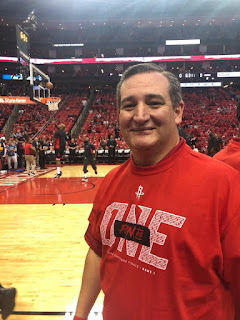 "Spurs fans should seriously consider giving to Ted Cruz for Senate or risk the possibility of Cruz buying Spurs season tickets and attending every game." Fundraising from the summons letter has been brisk. "No one likes Ted. Stay in Houston."